Can your musical recorder tell you the speed of sound? Can your recorder tell you the speed of sound? 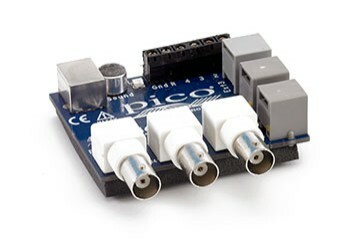 With the help of DrDAQ educational data logger and PicoScope’s Spectrum Analyser, see how you can determine the speed of sound using a recorder. This Science experiment is adapted from the Salters Horners Advanced Physics Project. It corresponds to Activity 11 from the ‘Sound of Music’ section of the course. A recorder is basically an open pipe which, when played in the normal way, develops a standing wave between the open end where you blow and the first open hole below the mouthpiece. The exact locations of the displacement antinodes at each end of the standing wave can be quite difficult to pinpoint but, for this experiment, it is sufficient to take them as the tip of the mouthpiece and the far end of the first open hole (Figure A11.1). f = v/2l where v is the speed of sound in air. The spectrum analyzer allows you to measure the frequencies in a recorded sound. Measuring the frequency of just one note would give a crude value of the speed of sound. A much better technique would be to measure f and l for several different notes, and plot a graph. Sketch the shape of the graph you would expect if you plotted (a) f against l and (b) f against 1/ l.
What would be the gradient of a graph of f against 1/ l? Draw up a table for recording your values of f, l and 1/ l. Take care to head each column with appropriate units. Load the PicoScope software and bring the Spectrum Analyzer on screen. Set the Frequency Range to 1200 Hz; the X gain to 1; Input A to Sound; the Trigger to Single, Sound, Rising, 40 mV*; and the Display setting (right-hand box at the foot of the screen) to 0%. Click GO and play the note C as shown in Figure A11.2. * You may be able to lower this value but it must be large enough to stop triggering too soon. A frequency spectrum like that in Figure A11.3 should appear. Click the cursor on the peak of the lowest frequency present with a relatively large amplitude. In Figure A11.3 this is at 536 Hz. Record this frequency, its fundamental frequency, in your table of results. Click on ‘View’ and then ‘Clear’ in the drop-down menu that appears. Repeat the process for the other notes shown in Figure A11.2, each time noting down the fundamental frequency. Measure the approximate length l of the standing wave for each note. Record these lengths in the table. Calculate 1/ l in each case and record these values in the table also. Label axes with their units. Use a sharp pencil to plot each point as a small cross or as a small dot plus circle. Draw a line of best fit - a single straight line drawn with a ruler. Draw a right-angled triangle, as large as possible, with the line of best fit as its hypotenuse. Calculate the gradient of your graph and hence calculate the speed of sound in air. The speed of sound in air is about 330 m/s at 0 °C and about 340 m/s at 20 °C. Compare your results with these values. What do you think was the largest source of inaccuracy in the measurements that you took? Your line of best fit might not have passed exactly through the origin of your graph. How do you think this could best be explained?